Cycling in Kazakhstan was hot, dusty and super challenging but China has just swept the board – certainly in the heat department. (I am still awarding KZ the ‘Worst Roads’ in the world award). I write this on a rare (but exceedingly welcome) Rest Day, from Jiayuguan, Gansu Province, in the North of China, the place where the Great Wall starts at its most westerly end before running East to Beijing. We, too, are headed for Beijing, though recently it has been at more of a plod than a run. Daily mileages have plummeted and the main goal for the day has often been ‘ Eat, drink, pedal where possible and mind the poo.’ Any miles East have been good miles because it has been such a slog to cover them. Yes, it is still ‘we’ as Gao trucks on, mending bits of his ‘Made in China’ kit as we go, flag still billowing, grin still huge. Yes, he is slower than I am and falls asleep at the table of every place that we eat at, but he is great company and having a wonderful adventure. Besides, his Chinese know-how is both super interesting and super useful as well, so I am still glad that he and his bike Stranger are here. So then, to the pedalling, slogging and poo. The slog has been thanks to the hottest region in China (Turpan) and the fun and games presented by the Gobi desert. Gao and I hit Turpan just a couple of days after he joined me. At 45 degrees, pedalling after midday and before sunset was well-nigh impossible. The only way round it has been to live a strange existence whereby we have pedalled when it is cool enough and slept when it is too hot. This has meant lots of night rides, each one an increasingly tough battle with sleep monsters, as we have also been pedalling in the cooler parts of the day. Generally in the wee hours, eyelids heavy and almost falling off our bikes with fatigue, we pull over, roll out our mats alongside our bikes and sleep for an hour or three, depending on how bad I am at snoozing my alarm. Every time it goes off my whole body rebels at the thought – sleep is all I have wanted since we started this night riding lark. It is beautiful to be out under the moon – lately a wonderful silvery full – and delicious to be cool and not sweat with every breath, but it has taken its toll. Once the sun is too strong to pedal or the winds have beaten us back (we have had fierce headwinds for what seems like forever) we look for shelter of some sort from both heat and light. On one occasion this was our tents – an utterly hideous experience of sweating and sticking, and on another it was a tunnel beneath the road – also hideous but rather cooler than the tent. The most unrestful (I am sure this is a word somewhere in the world) was the other day as we sought refuge from the 40 knot winds which had blasted us all day. There was only a road bridge, offering moving shade as the sun swung round and the tiniest bit of wind protection behind the narrow columns supporting the whole structure. Where we have been lucky we have found a little hostel or hotel to wait it out and sleep and rest and sweat a little bit less than if we were outside. As such, the pedalling has been tough at times, really grit-your-teeth and get-on-with-it sort of tough. The sort that, once finished and fed, your thirst quenched and, if you’re really lucky, washed and clean again, makes you glow inside with quiet satisfaction at having made it through. I had heard that this road we have been on through the Gobi hit a 300km stretch with nothing on it – having pedalled it, that’s not true at all. There have been oil stations or villages every 80-100km. However, the 300km bit was a lie – it has been much longer than that, more like 800km of hot, dry, dusty landscapes. Until yesterday all the river beds I had seen were dry, marked only by scrubby vegetation and the tell tales marks of eroded mud, and I hadn’t seen a tree outside of the managed interior of a city for days. But I had seen some beautiful sights – sandstone mountains, shifting dunes, sunsets and sunsrises and some interesting wee creatures and plants, all of whom are far better adapted to life in the hot than this ‘ere cyclist. Your readings makes us wonder what next will be coming your way. Your words are so perfect at describing your travels we feel as though we are there with you in person. How many Mars Bars have you eaten to cope with the last few days and what happens with all the heat. What an inspiration to us all back at home, when I come up against difficulties now I think of you so much and say well sarah wouldn;t give up so I can’t. What a credit. Way to carry on and deal with the conditions especially staying hydrated…! Those poor chocolate bars couldn’t really be anything but a ‘hot chocolate’ beverage?! The sanitation conditions and infrastructure will get better from my experience in other provinces including the mountains of Yunnan. Best, Currin (winter in NZ),,,getting ready for adventure research in China, soon. We’re all still rooting for ‘yous’ (as they say in Scotland). I wonder if you’ll relate to this part of your adventure when you’re on the high seas?! We’d happily swap a little of your heat and dust for the wet monsoon that’s called summer here (but we’ll stick on the poo, thanks…) Bon chance et bon courage Sarah. Great stuff and utterly absorbing. I check every day for a blog update. Very best wishes to you and especially Gao -‘Just do it’ is a slogan that’s become tired through overuse, but it’s wonderful when someone really does just do it. I’m amazed at the 20mph/ kph (?) sign, can anything actually go anyfaster than that. Also wondering if you have enough looroll! Whenever I log on your adventure seems to be different. What a load of experiences youa re having, both of you now. hey Sarah, have just started following your adventures. 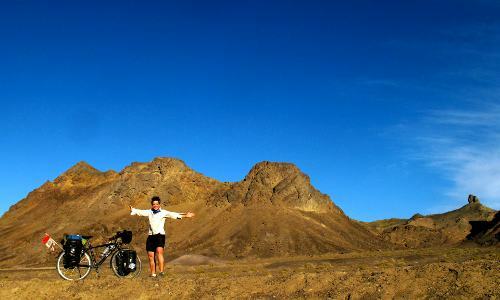 I cycled through the Gobi in May, in Mongolia, rather than China, but I have some idea what you are up against. The wind is a force to be reckoned with eh? And there is nothing to stop it as it rolls across the land. I can safely say it’s the hardest thing I’ve done to date! It’s great to read your blogs and watch your videos, makes me grin with appreciation. You are way tougher than me with your night time rides and so cheerful too, but what else can you be with the full moon and the desert for company?! Keep on going, Beijing will seem like a land of paradise when you get there. Oh and big respect to Gao, amazing! “Don’t mind the mule, just load the wagon” or “Onward through the Fog” in either case you’re truly an inspiration and if you get near Portland where I’m nesting I’ll buy you a cup of serious java or ale.